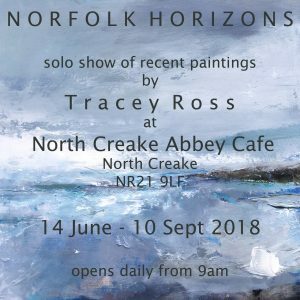 Following on from the success of my 2016 exhibition, I am delighted to announce my second solo show at North Creake Abbey cafe for 2018. This exhibition shall feature a new collection of artwork exploring the beauty of the North Norfolk coastline. Work is already underway to create a vibrant show of large colourful artworks which aim to capture a spiritual moment of this stunning coast on canvas. This three month show will be well work visiting!